Activists around the world protested in solidarity with this demonstration in Cambridge. On Sunday, we led a protest at the World Wide Web Consortium (W3C) against the attempt by Netflix, Hollywood and other technology and media companies to weave Digital Restrictions Management (DRM) into the HTML standard that undergirds the Web. With about 75 activists protesting outside an ongoing W3C reception, it was the largest protest ever at the standards body. It featured speeches by three of our allies in this struggle: Chris Webber of the GNU MediaGoblin decentralized publishing platform, Harry Halpin, a W3C staff member that pledged to resign if DRM is allowed into Web standards, and Danny O'Brien, who represents the Electronic Frontier Foundation at the W3C. In a dramatic and unexpected turn of events, a small group wearing Anonymous masks broke away from the protest and tried to enter the W3C meeting, where they were ejected by police. 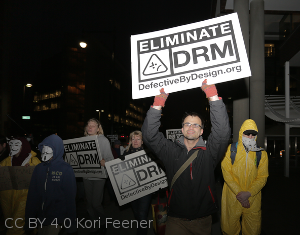 Then, the remaining protesters struck out from the W3C office, marching through the chilly night chanting "We won't leave it up to them; just say no to DRM." We paused our march at the nearby offices of Google and Microsoft, which both support DRM in Web standards. DRM in Web standards would make it cheaper and less politically costly to impose restrictions on users, opening the floodgates to a new wave of DRM throughout the Web, with all the vulnerabilities, surveillance and curtailed freedom that DRM entails. The fight against digital restrictions in Web standards is a new front in the struggle for liberty and expression on the global network. It matters for many of the same reasons as protecting strong encryption and net neutrality, or reigning in online surveillance: Increasingly, the Web mediates our politics and our society. Raising our voices in protest helps make this clear to the broader world -- it's a crucial duty of those who care about computer user freedom. In the week before the protest, Dutch activists held their own demonstration at the Amsterdam W3C office, and a Brazilian Web expert met with staff at the W3C office in São Paulo. Concerned people from around the world posted selfie photos with protest signs against DRM, many in front of other W3C offices. For every person at the protest, there were about five hundred who spoke up online against DRM in Web standards. We're confident that the W3C felt the pressure from our in-person and online protests. They responded with multiple posts on the topic in recent weeks, and the protest was covered by the tech journalism sites Motherboard and Boing Boing. Moving forward, we'll keep drawing attention to this issue, and we'll fight every step of the way to protect the Web from DRM. We may have more news after the end of this week's W3C meeting, over the summer or after the W3C meeting scheduled for this fall. Want to learn more about the campaign against DRM in Web standards? Read our position letter.